The design of the Hippo enables more water to be transported more efficiently than traditional methods. The Hippo, with its large drum capacity of 90 liters / 24 gallons, frees women and children from having to spend a large portion of every day dedicated to collecting water for their households. Far less effort is required to roll the heavy weight of water (90kg / 200lbs) along the ground rather than carrying on the head. 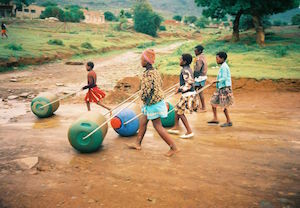 The Hippo roller enables people to transport almost five times the amount of water than the traditional heavy 20 kilograms buckets. Extensive field tests over many years and various awards have proven the effectiveness of the Hippo Water Roller.